Take a look outside, the weather has cooled down, leaves are starting to fall from the trees and the days are getting shorter. Enjoy the autumn months while you can because winter is just right around the corner. We aren’t trying to rush the seasons along here, we just want you to be prepared for what will eventually come: cold and snow. Winter months can present many challenges for your car, truck or SUV. And while modern vehicles are designed to handle bad weather conditions, there are steps you can take to ensure a safe ride. 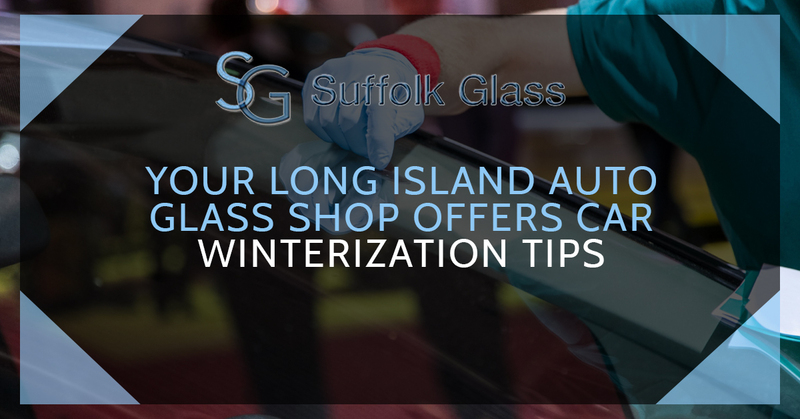 Suffolk Glass, your Long Island auto glass repair shop, offer tips to prepare your vehicle for winter. While all-season tires will get you through the winter, snow tires are the superior choice. Many vehicle manufacturers recommend having snow tires mounted for the winter, and for good reasons. Snow tires are built with a rubber compound that stays very pliable, even in cold temperatures. This, of course, enhances traction and makes it less likely you will slip out of control. It also gives you more control should you have to stop quickly. If you have small cracks or chips on your windshield, the cold temperatures of winter will make them worse. It’s a good idea to have your windshield examined by an expert. You should also seriously consider having your wiper blades replaced to ensure they can handle the elements. And don’t forget to fill up with washer fluid that is rated for subfreezing temperatures. Battery capacity will decrease significantly in cold temperatures, so it is important to have it checked to ensure peak performance. When you take your vehicle in to have an oil change, most places check all of the fluid levels and top everything off. They will also test your antifreeze to ensure your engine won’t freeze up and leave you stranded. Keeping an emergency kit in your car in the winter is always a good idea. No matter how well you prepare or how well your vehicle operates, there is always the chance you could get stranded. Items that you need to have in your emergency kit include a flashlight, blanket, cat litter, water and snacks. It is critical to have fully-functioning headlights and brake lights in the winter. The days are short in the winter and fog and snow flurries are common; you will want to do what you can to make sure you can see the road and others can see you. Take the time to check and make sure your headlights are properly functioning and you have no other lights on your car that need to be replaced. It is a pretty scary experience being stranded on the side of the road in the winter. It is a good idea to have a plan in case such an unfortunate incident happen. If you don’t subscribe to AAA or some other similar service, at least have the phone number of a friend who would be willing to come get you. If you need a windshield inspection before winter is here, give us a call.